Multiple cars and SUVs were loaded with kindergartners bubbling over with excitement and enthusiastic energy as we headed out for our first (and last) field trip this morning. I drove Annelise, her sweet teacher and four lively boys. 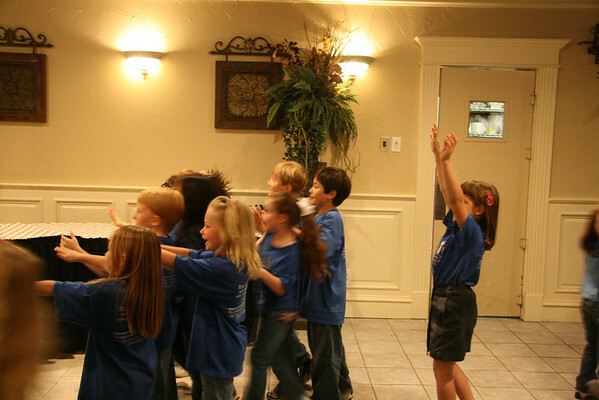 21 little ants, er...I mean children were soon settled in their banquet room to anxiously await all. the. pizza. fun. I was under what I soon realized was a misguided impression that there would be an educational demonstration, tour or at least brief bullet points on pizza or Italy or family owned businesses or something. My expectations were obviously way too high. 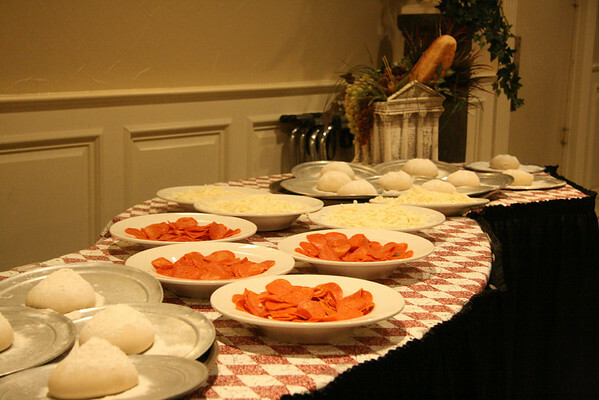 Each student was given a plate with a flour coated dough ball and told to start kneading it. So they did. 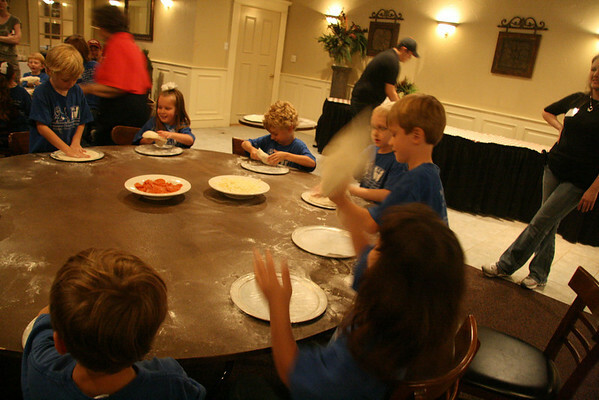 After pressing, punching, shaping, and pinching (the dough, not each other) it was time to fly their pizza. Annelise loved this part. A lot. Until she socked herself in her eye. Oops! 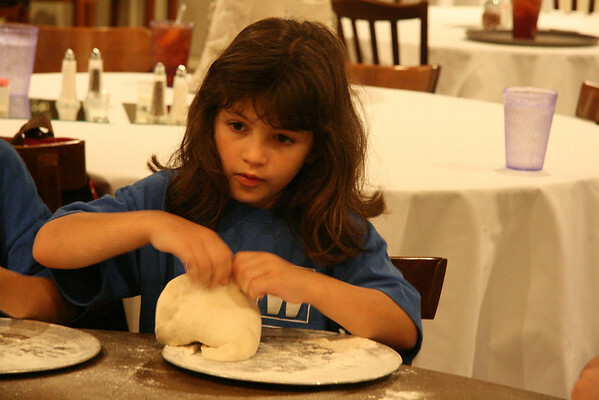 On one fling she overshot a bit and her dough landed on the floor. Isn't that so hygienic and tasty? 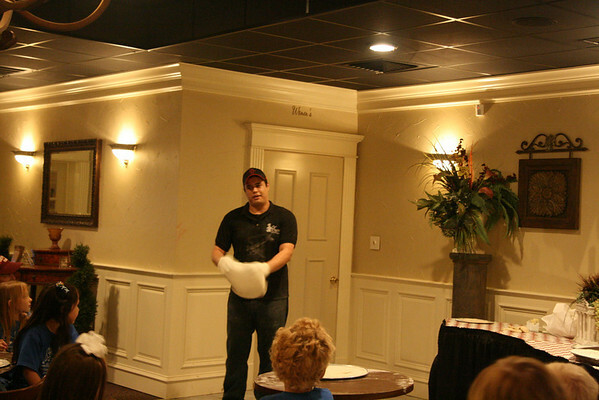 The pizza guy then talked about how they throw dough at each other in the kitchen when they get bored. Isn't that so hygienic and tasty too? He then chose one student to *catch* the dough when he, um... let it rip. Well, before you could say Mambo Italiano, all the boys and girls were jockeying for their turn. Um, pizza dude, that's really not such a good idea. It was like a horde of single bridesmaids jostling to catch a bridal bouquet. Thankfully no one was harmed, except the dough. They quickly settled back in their places and started to add cheese and pepperoni to their creations. It was probably a good call not to give them tomato sauce, yet their pizzas looked fairly pitiful without it. 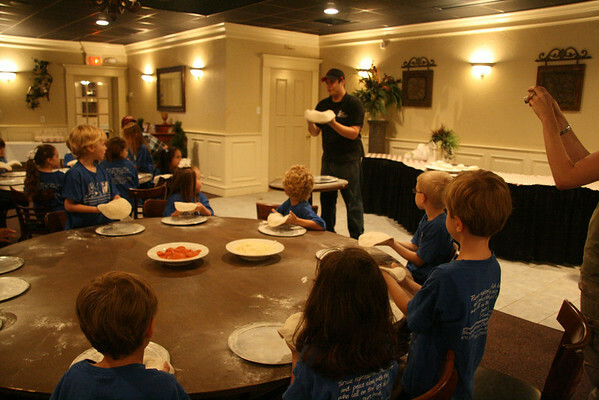 We then had to help them get their unbaked pies into boxes (which was like peeling wallpaper, these kindergartners were not so gentle with the dough) so they could be taken home four hours later and baked*. The *field trip* wrapped up with freshly baked pizzas and pink lemonade for all the boys and girls, which was of course, a crowd favorite. Now, not to sound like Nellie Nitpicker, but I was left feeling a little disappointed by the whole experience. Like, what was the point anyway? Make your own pizza? Cool, but we did that last week. Eat pizza? Yeah, did that too. I think they could have let the boys and girls at least walk through the kitchen, see how things work back there, see the pizza ovens, get a behind the scenes look at how a restaurant works, etc. I am Nellie Nitpicker aren't I? Oh well, Annelise had a blast either way, so I guess my expectation letdown doesn't matter. *Two guesses, and the first one doesn't count: do you think I'm going to bake (and let her eat) her oops-it-fell-on-the-nasty-floor-and-was-manhandled-by-numerous-hands-cheese-pepperoni-no-sauce-pie? Dean Martin is rolling in his grave I'm sure. Way to go with the mad camera skillz. 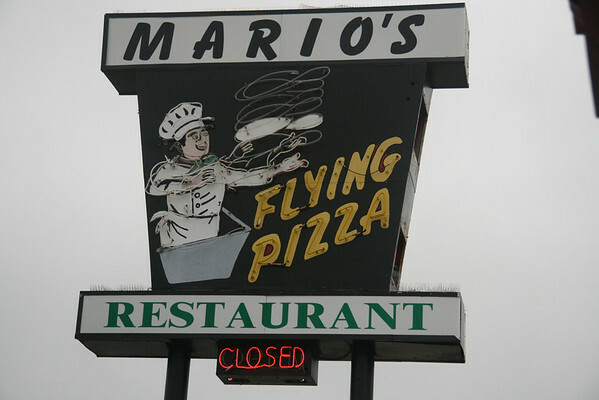 Aw, I'm sure that getting socked in the eye with your own flying pizza isn't a great feeling but it sure made me giggle, as did the rest of your post. I guess pizza field trips are the latest thing - we're going on one to California Pizza Kitchen in a couple weeks. I don't want to brag or anything, Nellie, but I hear we'll get a walk-thru of the kitchen. sounds fun but yeah, I would have thought a kitchen walk thru or something! 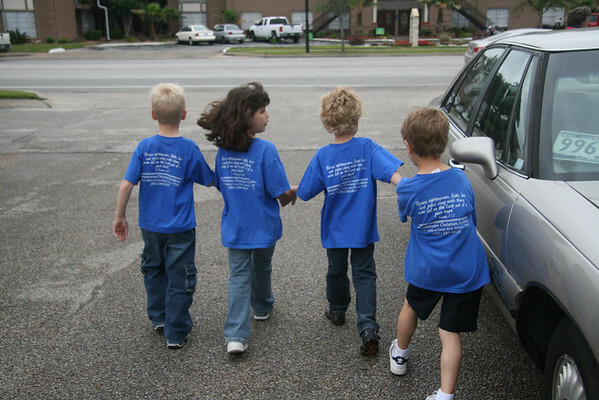 when my kids were small we went to field trip to Outback. that was a fun one! saw the kitchen, the big freezer, and they explained all the cool stuff on the walls. Another really good trip was to HEB! What a FUN field trip! Yeah, I don't think I'd be wanting to eat any of that pizza either! Griffin had a field trip at Young Chef's Academy earlier this school year and the whole thing about all the kids handling each other's food really grossed me out. 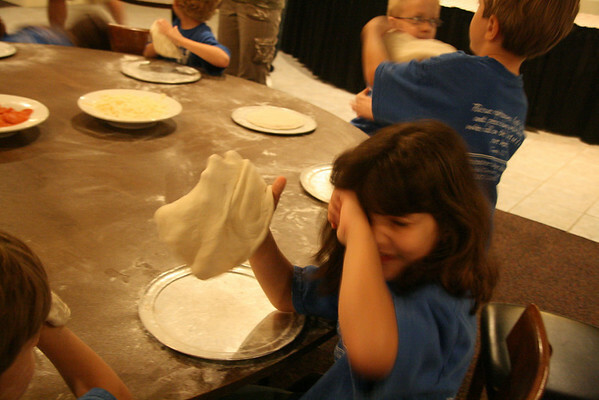 The dough throwing looks fun, but I would have been bugged about the noneducational aspect of the field trip as well.